Needs must and never is that phrase more pertinent than with this DIY weapon created by Free Syria Army rebels. When you are in need of a tank but don't have one then there is only one course of action open for you to take....build one yourself. 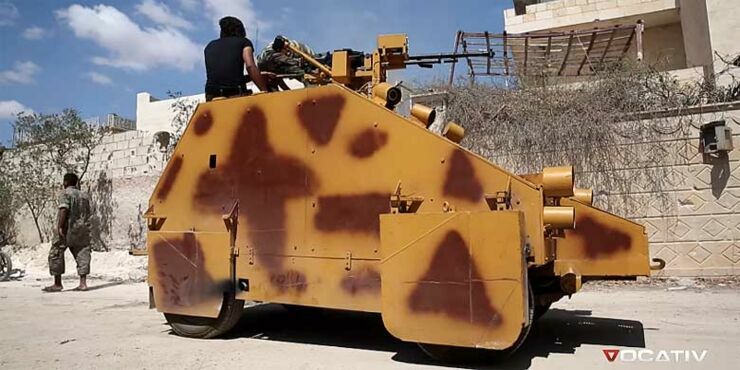 Down on resources but with ISIS and the Assad regime to fight, these rebels created a homemade tank which comes complete with a machine gun controlled by a PlayStation. The end result is total genius and something that would make even MacGyver proud. The rebel fighters say they intend to use the homemade tank primarily for recovering injured personnel, a hole in the back of the vehicle allows those inside to quickly exit the thank, grab the injured soldier and take him to safety. The body of the tank was built using scrap metal which they welded onto an old truck before fitting it with 0.50 calibre machine gun. But they needed a way to control the gun, so they hooked it up to a PlayStation 2 controller so someone could sit in the tank and fire it. The video at the top of this post, from Vocativ, shows the rebels using the tank, driving it about and firing it, which they say will be mainly used for rescuing injured fighters.